Selecting the correct USB 3.0 connectors and cables is critical for achieving the maximum data rate for high speed data connections. Designers should begin by choosing a USB 3.0 connector vendor that adheres to the USB-IF Compliance Program standards. This ensures that the products will meet reasonable measures of acceptability and interoperability in accordance to the Universal Serial Bus (USB) specification. At its basic level, the USB specification defines the product design targets at the level of interfaces and mechanisms. USB connectivity is the most prevalent physical interface, with over 12 billion USB ports implemented in the global marketplace. This is growing by about 2.5 billion ports annually. Shown below are the pinouts of the various USB 3.0 connectors which are supported by the USB specification. These are “Standard”,” Mini”, and “Micro”. The white areas in these drawings represent hollow spaces. As the plugs are shown here, the USB logo (with optional letter A or B) is on the top of the overmold in all cases. Pin numbering looking into receptacles is mirrored from the corresponding mating plug on the cable or device which is inserted into the receptacle (i.e., pin 1 on plug connects to pin 1 on the receptacle). The connectors are typically available in both a surface mount and through hole package type. 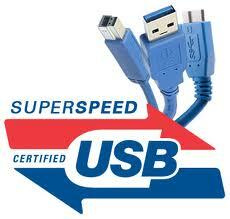 USB 3.0 supports a theoretical maximum data rate of 5 Gbps, which is a 10x increase over the earlier USB 2.0 standard. To ease integration and provide a seamless migration for both consumers and vendors, the USB 3.0 connectors and cables are backward compatible to USB 2.0. However, in addition to the increased data rates, USB 3.0 also allows for better power efficiency by eliminated device polling while reducing both the active and stand-by power requirements. Unless you are developing a connector to connector mating product, you’ll need a cable to interface USB enable devices. Standard lengths for cables are 1 m, 2 m, 3 m and 5 m. After 5 m, you may encounter data transfer issues due to the signal propagation delays as well as signal degradation from the losses in the copper wire. It’s important to select a cable vendor which has high manufacturing standards, quality wiring and precise bonding of the wires to the connector pins to ensure that you achieve the highest data transfer rates and long term reliability. ASSMANN WSW components offers USB cables in the standard lengths as well as custom sized cables. For both the cable and the connector, another consideration is the maximum power load that USB 3.0 can deliver. USB 2.0 supported an upper limit of 500 mA per single “load” while USB 3.0 is specified for a maximum of 900 mA. The minimum load required by USB-IF is 150 mA. The 900 mA and 150 mA are referred to as “high-power” and “low-power”, respectively. There is an additional specification for “Battery Charging” applications in which a USB 3.0 port provides 1.5 A, but without any data transfer. The physical connectors and cables are required to handle a 5.0 A maximum. For designers looking to implement USB 3.0 in their product offering, DigiKey is a distributor of connectors and cables from ASSMANN WSW components. Below is a linked list to products and information.